Sunday, 3/13/16 - Fly out of Denver International at 8:00am. We would have layovers in San Francisco and Seoul, Korea to eventually arrive in Hanoi, Vietnam at 10:00pm on Monday, 3/14/16. Tuesday, 3/15/16 - Tour two different factories, splitting our day between the two. Wednesday, 3/16/16 - Travel south to our Vietnam apparel factory for the full day with them. Thursday, 3/17/16 - Fly from Hanoi to Guangzhou, China at 8:30am. We would land in China at 11:00am and head straight to our apparel factory there. Friday, 3/18/16 - Day #2 with our apparel factory in China. Sunday, 3/20/16 - Day off in Bangkok! Monday, 3/21/16 - Tour our factory in Bangkok and discuss our new partnership with them. Travel back to the airport to take the red-eye flight to Seoul, Korea. This would be our only opportunity for sleep this night! Tuesday, 3/22/16 - Arrive in Seoul at 5:00am, spend a few hours prepping for meetings and getting ready for the day. Spend the day at the main offices of our factory partners in Korea. Wednesday, 3/23/16 - Spend one last morning with our partners in Korea, then head to the airport for the final time. Depart Seoul Korea at 3:00pm, gain back a ton of time and arrive home 1:45pm. Our issues started right away, when fog in San Francisco delayed our first flight out of Denver. Because we had a short layover there, we naturally missed our connecting flight and had to re-schedule on a different airline to Seoul. Luckily, that flight allowed us to catch back up to our last leg to Hanoi, BUT it meant that our bags didn't make it with us. So we spent our entire first two days of the trip without our luggage. Happy to say that our bags did arrive at our last hotel on Wednesday night in Hanoi. We had just enough time to grab items out of the bags, and re-pack them for our next day of travel. Things went fairly smoothly after that, until I started to feel sick in Bangkok. The combination of everything hitting me at once kind of knocked me down for a couple of days. I didn't have much of an appetite and everyone kept telling me that I had lost a lot of color in my complexion. It was a bummer, because after eating food in Vietnam and China, I was excited to eat in Thailand and Korea!! And these were the days I just couldn't do much... 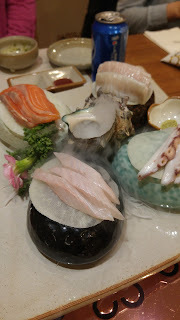 But we did have a beautiful meal of Korean BBQ on Tuesday evening, and I tried to eat what I could. In Korea, our driver from the factory was unable to show up due to the company having several client meetings that same day. So we had to wing it and find a bus ride into the city, and we found that Seoul has a really fantastic public transit system. The seats on their buses were nicer than any bus, car or airplane I've ever been on! On our way home, we were slightly delayed in Tokyo, Japan for our layover, but this didn't really bother me. I was actually happy to have some extra time to feel like our bags were guaranteed to make it on our next flight! But then as we flew from Tokyo toward Denver, we heard news of a huge blizzard hitting the city! Denver got 18" of snow on Wednesday. The main highways were all closed down, and over 1,000 flights were canceled. People were trapped in their cars, stuck at the airport whether they were coming or going, and the entire city was having a snow day. In hindsight, we were very lucky that our plane diverted to San Francisco instead of heading home. At the time, we couldn't believe our horrible luck, as we were all just dying to be home! But the sun was shining in California, and we were able to book the first morning flight out and find a good bed to sleep in for one more night. I finally got home yesterday, one day later than expected. Upon arriving in Denver, we were one of hundreds of flights coming in to make up from the loss of the day before. So the airport was over-crowded and crazy. 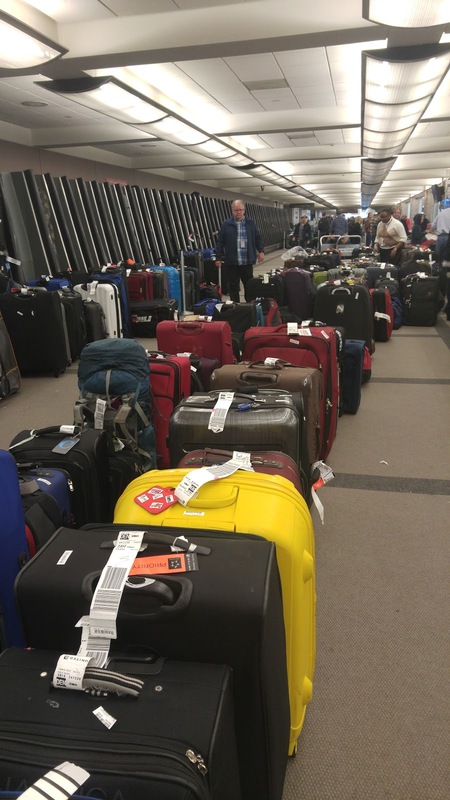 We taxied to find an open gate for 30 minutes, and waited for our bags for another hour. 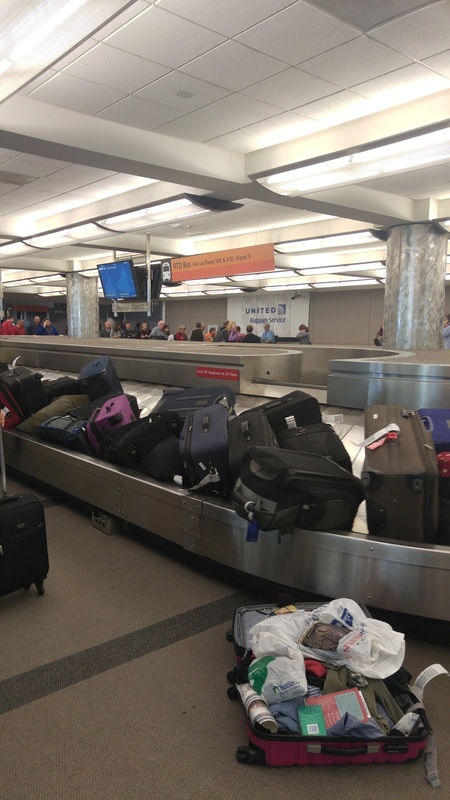 People and bags were arriving at different times, so baggage claim was packed. 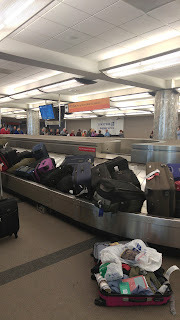 Apparently, we were lucky that it only took an hour to get our luggage! I am very happy to be home now. To put a positive spin on the challenges we faced, I think we all learned how to deal with a lot of different situations when you're in a difficult one. In the end, I was happy to have others there with me for the help and support each time we faced another set-back. And despite the craziness, I still do just really love traveling for work. It is truly one of the perks of this great job!